I got my start as a graphic designer laying out ads for a newspaper in southern Minnesota. I had an old fashioned “in and out” box on my desk. Am I dating myself? Ad copy would pile up in the “in” box and finished ads loitered in the “out” box, waiting to be proofed. Every so often our proof reader, Hallie, would come by and empty my “out” box. She’d return my stack a few hours later. My routine was to pour a cup of coffee and thumb my way through the return pile. Most ads had minor corrections. 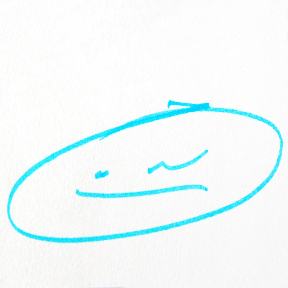 Ads that were perfect though got a signature Hallie smiley face scrawled with her blue proofer’s pen. Oh how I loved to find a perky little smiley face lurking in the corner. Ads that were really messed up got a confused face. And if an ad came through the proofing rotation more than twice, you could expect an evil stink eye. Shudder. It quickly became clear to me that Hallie was a master. Nothing got by her. 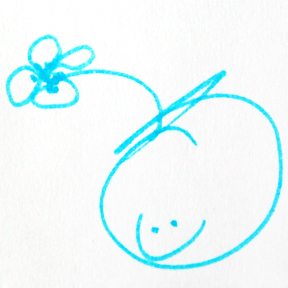 And boy could she draw a smiley face. I marveled at her ability to give a simple little face so much expression. Her faces frequently made my day. I actually started a smiley face file. Every once and a while I’d clip a face until slowly I amassed an envelope full of smileys. And let me tell you, when you’re feeling down and you dump out a pile of smiley faces that someone has drawn, it’s hard not to feel at least a little bit better. It’s been over 10 years since I left the paper, but I still have my envelope of smileys tucked in my desk drawer. Just in case. The staff at the paper was small and frequently we’d gather together for lunch at the back table, sharing bits and pieces of our lives. Hallie’s kids and grandkids are scattered all over the country and I loved hearing about their lives. She could also talk food and gardening to no end. Truly a woman after my own heart. We shared many meals and swapped many recipes. 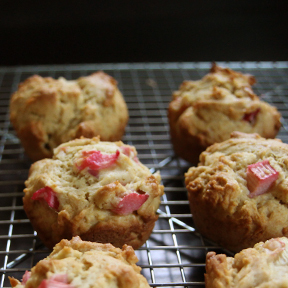 I start every rhubarb season off with a batch of Hallie’s rhubarb muffins. 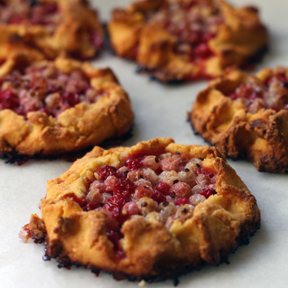 Made with brown sugar, they have a rich carmel flavor that pairs beautifully with tart rhubarb. Last week I baked my third round of Hallie’s muffins in as many weeks. They’re that good. I packed a few muffins and a thermos of tea to take out to the bee yard for a hive check. My two new hives have been limping along with the cold spring weather – which has resulted in me clucking around them like a nervous mother hen. Out at the bee yard I pull the lid off of hive one and find a gorgeous queen, busy at work. Her brood pattern is good, but it’s still in small patches on the frames. Her hive population is small too – all young nurse bees and not many foragers. I close up the hive and give them a reassuring pat. The situation in hive two, however, is all together brighter. After multiple hive checks, I’ve yet to lay eyes on this queen, but that hardly matters. My heart leaps at her handiwork – frame after frame of perfectly laid brood. In a week or two this hive will be bursting with bees. I remove my veil and take a seat on an empty pallet for a cup of tea and a muffin. I decide to call the elusive queen in hive two Hallie Frances. She has earned a smiley face, no question. I think I’ll even tape one of Hallie’s smileys to her hive for extra encouragement. I mull over hive one. This queen is younger by a good two weeks. I’m confident that she’ll catch up. Last fall I named the daughter of my all-time favorite queen Ella Bella – after another woman whom I respect and admire (childhood idol turned adulthood inspiration). Sadly this little hive did not get a fair shake and they met their match with this winter’s unrelenting cold. So I decide to call my new underdog queen simply, EB. Hell, maybe I’ll give her a smiley face too. Smile power works – I know. I pack up and test the voltage on the electric bear fence before I go. Finally I can relax. I’m heading into the summer bee season with two strong ladies at the helm. And that, makes me smile. 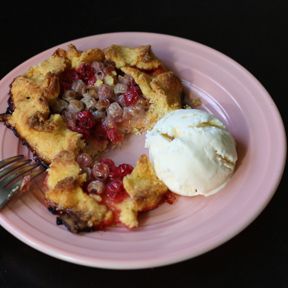 I don’t care for overly sweet rhubarb baked goods, so I do not pack the brown sugar. I also prefer a very rhubarby muffin. Adjust both to suit your taste. Cream together brown sugar, oil, egg, and vanilla. Mix together dry ingredients and add to creamed mixture alternately with the buttermilk. 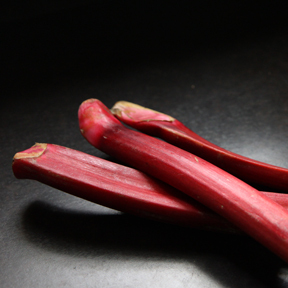 Fold in rhubarb and optional nuts. Batter will be thick and sticky. Fill muffin tins 3/4 full and bake at 400º for 20 minutes. Makes 1 1/2 dozen regular muffins. 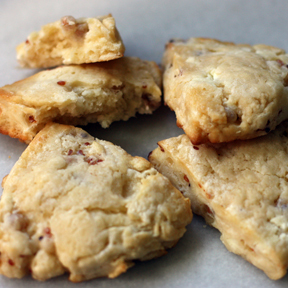 Believe it or not, there is a special place in my kitchen for Pillsbury Pop n’ Fresh Biscuits. Normally I’m more of a “do it from scratch” sort of girl, but the Dough Boy has long held a spot in my heart. This most likely stems from early childhood, when I became very attached to the whole Pop n’ Fresh family. This was in the 70’s – pre action figures. My Pop n’ Fresh toys are more like static rubber dolls, but the heads on all of the adults do spin. I have the whole Fresh clan. Grandpa Fresh, Grandma Fresh, Mrs. Fresh, Poppin and Poppie (the kids), BunBun (baby Fresh), Biscuit (the Fresh cat), Flapjack (the Fresh dog), and of course Pop n’ Fresh himself. I was especially taken with Biscuit. He went everywhere with me. When I was about six my family took a trip to Sweden to trace my mother’s roots and visit long lost relatives. This was my first big trip and I packed carefully. I singled out Biscuit to keep me company on the long overseas flight. But after we were settled in our seats, I was dismayed to find my little cat was missing. Really the only thing I remember about my one and only trip to Sweden is the agony I felt over loosing my best companion. That and I got nipped in the stomach by a pony at some relative’s farm while trying to feed it an apple slice. It was a traumatic trip. But my luck shifted upon arriving back to the States. It turned out that Biscuit had spent the entire trip to Sweden under the guest bed at my grandmother’s where I had slept the night before our flight out. And oh the relief to have the whole Fresh family reunited again! I think this incident is what really sealed my allegiance to Pillsbury. That and my mom was good enough to fuel my love of being in the kitchen by supplying me with kid-friendly recipes. One of my signature dishes was weekend Sticky Buns – made with a tin of Pillsbury refrigerated biscuits. It was so thrilling to pop open the roll of biscuits. And the gooey warm buns that resulted were a treat to be sure. Gradually, I evolved in the kitchen and outgrew my Sticky Bun phase. But not without having made them often enough to commit the recipe to memory. 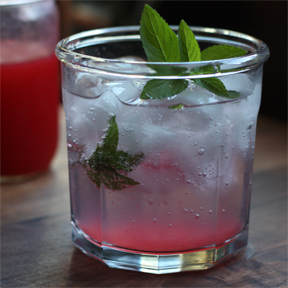 Several years ago, after what seemed like an arduous amount of time in the kitchen preparing fancy meals and copious holiday baking, I was racking my brain for something quick yet festive to ring in the new year with. Frankly the thought of my usual homemade cinnamon rolls for the first breakfast of the year felt like too much effort. And that’s when it hit me. Sticky Buns. Ten minutes to assemble, ten minutes to bake. Exactly what I was looking for. 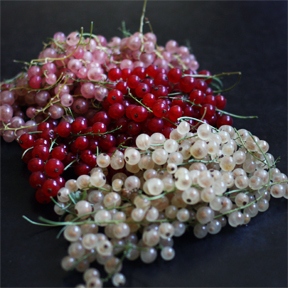 And they were even – a little to my astonishment – as good as I remembered. For a slightly more grown up flare I switched from light corn syrup to honey and added a hint of vanilla. But beyond that, I’ve never looked back. A strong pot of coffee and a plate of Sticky Buns has become my New Year’s Day morning tradition. I look forward to it every year. Even though popping open the can of refrigerator biscuits still makes me jump. 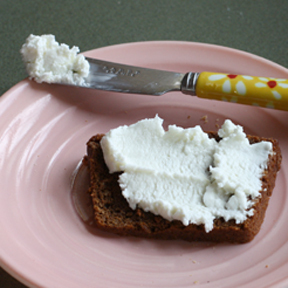 Cut each square tablespoon of butter into quarters. Take two of the pieces and grease 10 cups in a standard muffin tin. Take the other 10 pieces and put 1 in each of the 10 muffin cups. Add 1 teaspoon of brown sugar and 1 teaspoon honey to each cup. For a little extra flavor you can also add 5 to 6 drops of pure vanilla in each cup. Sprinkle a few raisins in each cup (or if you want to branch out like Peter and Katie, add any combination of coconut, chocolate chips, and nuts). Pop open the can of biscuits and put 1 on top of each cup. Bake the Sticky Buns in a 400ºF oven 8 to 10 minutes, until the biscuits are gently browned. Run a knife around each bun. Then put a cookie sheet or tray over the muffin pan and invert the whole shebang. Give the bottom of each cup a tap with the base of the knife, wait about 2 minutes and lift up the muffin pan. Gently pry out any stuck buns with the knife. Makes 10 buns. I live in northern Wisconsin. Which means I live with no less than six months of winter. Truly, if I had it my way, I think I’d hole up and hibernate with the neighborhood black bears. But, no. It’s become pretty clear that no one else up here on the south shore of Lake Superior seems to share my sentiments. In fact, sometimes the winter months feel as jam packed as summer. Go ahead. Burst my bubble. I’ll do my best to embrace it. The craziness kicks off with Santa and Mrs. Claus arriving on the Madeline Island Ferry. And then there’s the Apostle Islands Sled Dog Race – a 2 day dog filled affair, followed by the Blue Moon Ball with the 20-piece Big Woods Band. We barely have time to catch our breath before the Book Across the Bay – a 10k ski race across Superior’s iced over Chequmegon Bay. Frozen beach parties, trips across the ice road to the Island, maple sugaring, snowshoeing. It never ends. 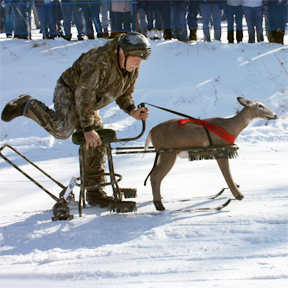 But the winter event that I have come to appreciate most is the Drummond Bar Stool Races. This is exactly what it sounds like. 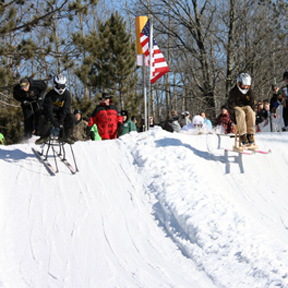 Every year, dozens and dozens of grown adults gather on the third Saturday in February to race bar stools mounted onto skis down a man-made hill. Welcome to northern Wisconsin. Laugh if you will, but people take this event seriously. Listen carefully in the crowd and you’ll overhear people discussing snow conditions, wax choices, barstool aerodynamics, test runs, and pushing strategies. 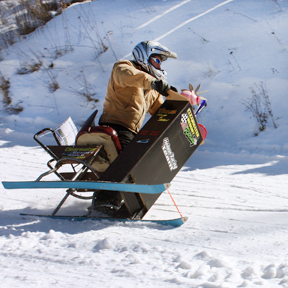 Barstool teams consist of two people – a rider and a pusher. A stoplight at the top of the hill gives pushers the cue to propel their rider down the hill. It doesn’t take long to discern that the best strategy is to have a pusher with some weight and brawn paired with a slim built rider. Shortly into our first time spectating, my husband leaned over and said “If we ever compete – you’re riding.” It’s been five years, and we still haven’t had the gumption to register. Notice how the pusher (in white) in the right hand lane has gone into an all-out belly slide? Notice how the rider in the right lane has caught some air? This particular third Saturday in February was a gorgeous, sunny 28º F day. I might have even gotten my recommended daily allowance of vitamin D. For whatever reason though, the course and conditions boasted an unprecedented amount of crashes and ties. It was a highly entertaining race. The barstool races have become a tradition for Mark and I, and we generally make a day of it – kicking things off with a hearty breakfast at the Delta Diner. The Delta Diner is an authentic roadside diner located in the heart of Delta, Wisconsin. Which means it is located in the heart of nowhere. But it is worth the trip. Really. Check your GPS. If you are within an hour (maybe even two) of Delta, make the detour. Owner and cook Todd Bucher provides a gastronomical experience that is unforgettable. Breakfasts are out of this world – including a thoroughly refreshing Mexican Eggs Benny. Add a side of crunchy hash browns and you won’t need to eat for the rest of the day. Also offered up are traditional blue plate specials, old-fashioned malts, fish-frys and specialty burgers. Todd and his wife Nina make a point of using as many local ingredients as they can find. Could it get any better? 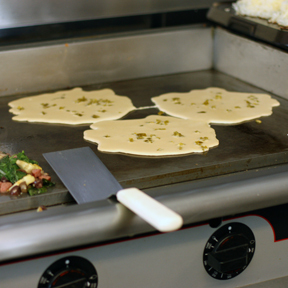 One of the house specialties is thin, Norwegian style pancakes. And while it’s not officially on the menu, if you ask for “hot cakes” Todd will throw a handful of chopped jalapeños onto your cakes. Brilliant! I have dreams about these pancakes. The tang of hot meeting sweet is so amazingly perfect. Why have I not thought of this before? 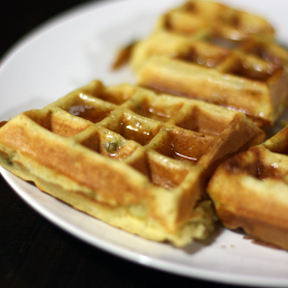 And so it is that I have Todd to thank for my latest kitchen inspiration – Jalapeño Cornmeal Waffles. I took my favorite waffle recipe (clipped from somewhere long ago), substituted cornmeal for part of the flour and added a healthy handful of chopped jalepeños to the batter. And whoo-eee did they ever surpass my expectations! 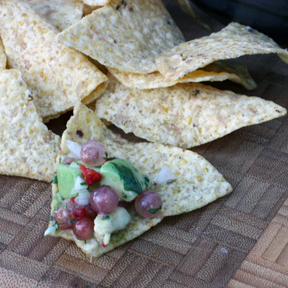 The cornmeal offers a perfect nutty crunch to the jalapeños. Winter does have it’s perks. And zingy waffles on a Wednesday night is one of them. Mix dry ingredients in a medium bowl. Separate egg, and reserve the white in a small bowl. Mix the yolk with the rest of the wet ingredients in a 2-cup measuring cup or bowl. Beat the egg white with a hand mixer until soft peaks form. Sprinkle in sugar and continue to beat until glossy. Beat vanilla into the egg white. Pour the wet ingredients into the dry and mix until just incorporated. Gently fold in egg white and jalapeños, but do not over mix! 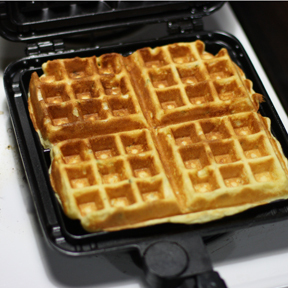 Add batter to hot waffle iron and cook until golden brown and crisp. Makes 2 full sized Belgian waffles. I’ve been in a breakfast rut lately. Maybe it’s the mid-winter doldrums. I mull around the kitchen, open the fridge, peer into the pantry, but nothing really jumps out at me. Except for this past week. This past week there was left over Valentine cupcakes. And yes. I have a weakness for cake. Especially when it involves breakfast. 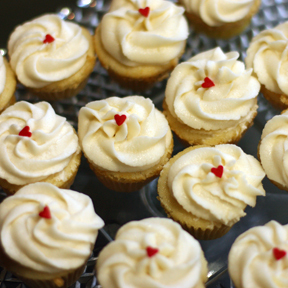 But, like all good things, the cupcakes came to an end. Which is probably just as well. Bikini season is just around the corner. This morning though, I realized the source of my problem. 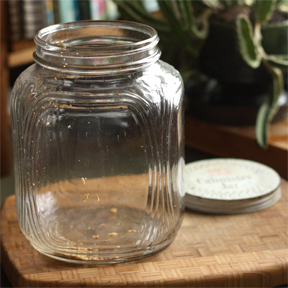 The granola jar has been empty for weeks. I’m not exactly sure why. We almost always have granola on hand. But there it was, empty as could be, staring me in the face. “Fill me” it whispered. And so I did. I have several granola recipes, but I tend to latch on to certain ones for long spells, making them over and over again – ignoring all other contenders. 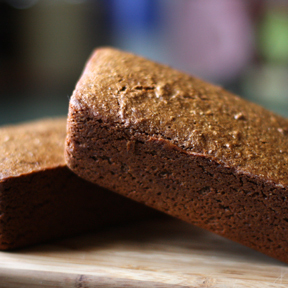 Among past pet favorites is a version loaded with toasty cinnamon. My friend Cari introduced me to it on a backpacking trip and I was immediately smitten. Three tablespoons of cinnamon takes the chill out of the morning air like nobody’s business. Before that it was a fruit laden number that I adapted from Bon Appétit. 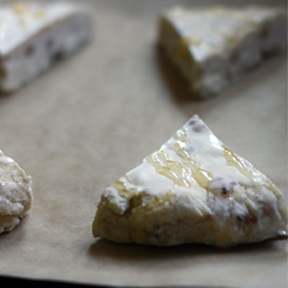 But my new, all-time, number one favorite, is a subtle, seedy affair with coconut and honey. It has stayed in rotation longer than any other. The recipe originated from sort of an odd source – the Anti-Inflammation Diet and Recipe Book, by an N.D. named Jessica Black. The subtitle beckons “Protect Yourself and Your Family from Heart Disease, Arthritis, Diabetes, Allergies – and More.” I picked it up a few years ago for the “and More” claim. Hopefully to help slow the progression of irreversible inflammatory glaucoma in my eye. 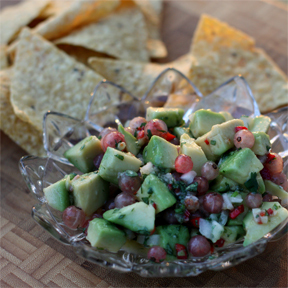 I have to admit that I didn’t have terribly high expectations for the recipes, but I have been pleasantly surprised with everything I have tried. If nothing else, the book is an interesting read. Black does an easy job of explaining the three different families of prostaglandins (fatty acids) found in foods. Two types (PGE1 and PGE3) are “good” and the other (PGE2) is a “not so good” pro-inflammatory type. Naturally, the book focuses on recipes with foods that are high in camps 1 and 3. But good or bad prostaglandins aside, this granola is a winner. I love that it uses honey for the sweet and coconut oil for the fat. Two of my favorite ingredients. (If the thought of raw coconut oil scares you, I urge you to do a little research. It’s an amazing fat that has gotten an unfair bad rap for way too long.) The light, subtle coconut flavor matches perfectly with the oats. 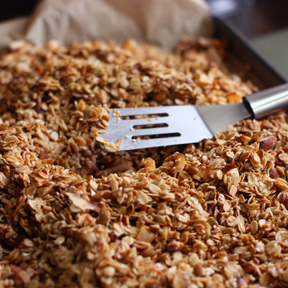 This is an understated granola but its flavor and texture are spot on. And who knows, maybe it really will help protect us and and our families from all the nasties out there. Who can argue with that?